I have decided to start posting up some pics of my car as I continue to build it. 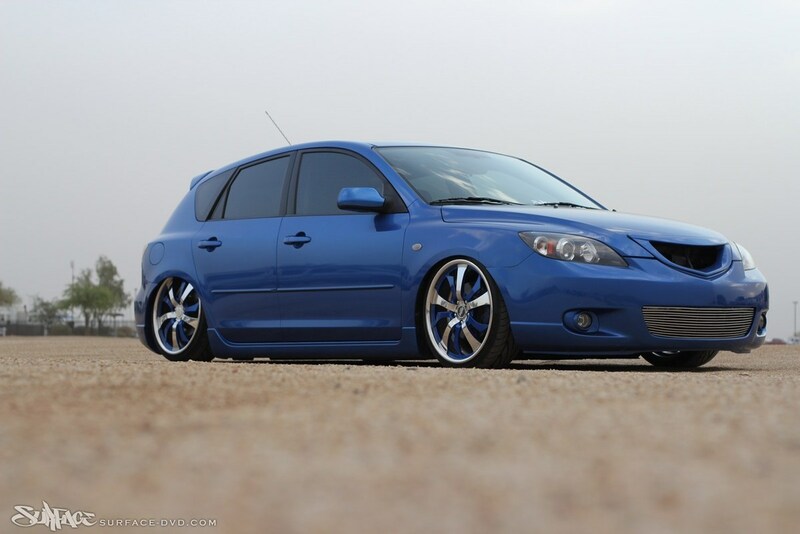 I have been going to a mazda 3 specific forum, which is great for answering questions related to the car. But, they all seem to dislike my taste in vehicle modification. There are some that like it, but I get a lot of thread bashing as well. Here is where it sits currently, I am getting the body straight then I will focus my concentrations on the suspension....Lowered springs are no longer cutting it for me. Here is where I am at currently. Stance Nation is a pretty good resource. Most of the guys there are too into the hella flush scene but there is a lot of good information on how people are going low. Looks good dude. I just finished baggin my 04 mazda 3. Let me know when you get there if you have any questions. 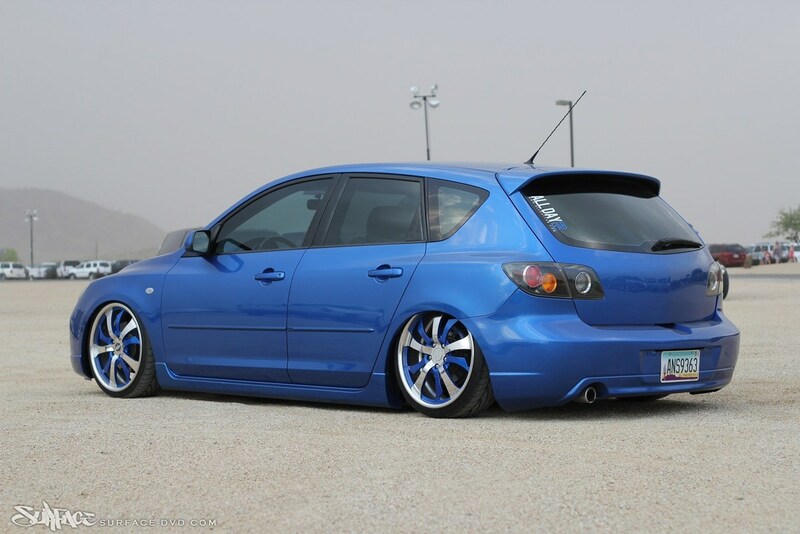 That blue mazda 3 is sick. I love the rim choice! You went with air instead of hydros? Ya I did air struts instead of the juice. It rides awsome and when I build my new struts it will set the front down level with the rear. I didnt want to mess with the mess that is hydraulics. The car is bulletproof. All the lines run inside the car and its running an ASCO manifold with viair 480. Its a get in it and go type of car. Did you build everything for your suspension setup, or did you buy a kit somewhere. I am guessing that you built it. I absolutely LOVE it. this is exactly what I am looking for. What advice can you give me? this is my first car that I have thought of bagging. I built lower control arms and cups for the rear. You wont get very low with the factory lower control arms in the rear as they bottom out on the sub frame before the car ever gets low. I used Universal air sleeve bags in the rear. The front still has the factory struts. I knocked the spring perches off and ran the Universal air strut bag with a custom uniball bearing. The front wont sit as low as mine if you just put the bags on the stock struts. you need to eliminate the factory top bearing and use something like a uniball or a power ball. Im working on a set of new front struts that should get me another 1inch of drop to make the front level with the rear. This is def. not a bolt on kit. Im not sure if anyone makes a kit for these cars as they are usually built into some racer style wannabe race car.